Sydney, May 21 (AFP) Australia today gave 7,500 boatpeople until October to prove they are genuine refugees or be kicked out, declaring the "game is up" for illegal arrivals ripping off taxpayers. Before the conservatives took power and adopted a tough line on the issue in 2013, an estimated 50,000 asylum-seekers flooded into Australia on more than 800 boats over the previous five years. Of those arrivals, the old Labor government processed nearly 20,000, leaving 30,500 to the current administration. Some 7,500 of them have yet to present their cases for asylum or are refusing to answer questions about their identity, while claiming welfare benefits, casting doubt on whether they really need protection. "This is a very serious situation and it's costing Australian taxpayers hundreds of millions of dollars a year," he said. "So if people think that they can rip the Australian taxpayer off, if people think they can con the Australian taxpayer, then I'm sorry, the game's up. "We are prepared to support people who are legitimate refugees, but we aren't going to support people who are just accessing welfare ... and then refusing to provide any information in relation to their protection claim." Of the 30,500 left to the current government to process, 23,000 have applied for protection. So far, 3,000 have been assessed as not genuine refugees. 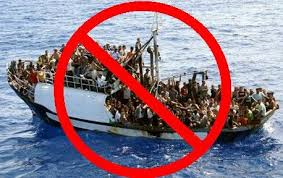 Dutton said the cost of processing and supporting the 50,000 boatpeople amounted to Aus 1.9 billion (US 1.4 billion) a year. "Australians have every right to question why an estimated 80 percent of illegal maritime arrivals arrived without any identity documents," he said. Under its current Operation Sovereign Borders, which has managed to halt the flood of boat arrivals, Canberra sends asylum-seekers who try to reach Australia to remote camps in Papua New Guinea and Nauru.